The faculty members of the UC Irvine School of Medicine Division of Geriatric Medicine and Gerontology are nationally known for their research in the field of elder abuse and neglect. At the Center of Excellence on Elder Abuse & Neglect we provide a valuable and much-needed bridge between direct service and academics. We aspire to stimulate new ideas, identify needed areas of inquiry, bring together researchers from across California and beyond and serve as a mechanism for feeding research findings back to the field. The bridge between direct service and academics will cause work in both sectors to be more effective in serving the victims of elder abuse and neglect. For a printable (PDF) document of research articles and other publications on elder abuse by Center of Excellence faculty and staff, click here. The purpose of this research study is to look at ways to reduce the problems that can sometimes lead to the mistreatment of older adults with dementia. In order to do this, we will recruit adults with dementia and their caregivers. We will conduct an initial risk assessment with both people, refer them to legal, social, and mental health services, and conduct another risk assessment three months later. We expect to enroll about 336 participants in this study. Orange County's Elder Abuse Forensic Center grew out of a need to have a group of educated, responsive professionals provide advice and assist in cases of elder abuse and neglect. However, most of the nation does not have access to physicians and psychologists who are trained in geriatrics and specifically in the issues related to abuse and neglect of elders. Telehealth offers an innovative and manageable solution to problems associated with providing this kind of expertise at a distance. There are many places around the country already using telecommunication technologies to improve access to medical services in child abuse and domestic violence cases, but none in the area of elder abuse. Increase access to medical and psychological expertise for frontline professionals working with elder abuse victims. 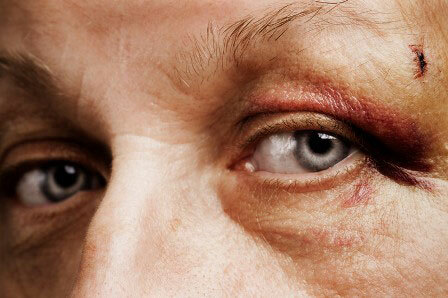 The objective of this study, funded by the National Institute of Justice, was to summarize the occurrence, progression, and resolution of accidentally acquired bruises in a sample of adults aged 65 and older, and compare these findings with characteristics of bruises acquired through elder physical abuse. The systematic documentation of accidentally occurring bruises in older adults could provide a foundation for comparison when considering suspicious bruising in older adults. Between April 2002 and August 2003, a convenience sample of 101 seniors was examined daily at home (up to 6 weeks) to document the occurrence, progression and resolution of accidental bruises that occurred during the observation period. Phase II of the study, Bruising as a Marker of Physical Elder Abuse, was also funded by the National Institute of Justice. Consenting older adults were examined to document location and size of bruises and assess whether they were inflicted during physical abuse. An expert panel confirmed physical abuse. Findings were compared with results of a study of accidental bruising in older adults. Researchers made home visits to 67 adults aged 65 and older reported to Adult Protective Services (APS) for suspected physical elder abuse. Occurrence of physical abuse was substantiated by a LEAD panel (Longitudinal, Experts, All Data: Geriatricians with experience in elder mistreatment considered all evidence of physical abuse). LEAD Panel members adopted Conceptual and Operational Definitions of Physical Abuse as criteria for their decisions. Physically abused elders were significantly more likely to have bruises on the face, lateral and anterior surfaces of the arms, and the posterior torso. A one-page summary of findings from bruising research (PDF) can be downloaded with Adobe Reader software and is available in English, Japanese, Russian, Spanish, Tagalog, and Vietnamese. To view a 10-minute video from the 2009 National Institute of Justice Conference session on Research in Action: An Elder Abuse Study Impacts How Law Enforcement Work Their Cases: visit http://www.ojp.usdoj.gov/nij/events/nij_conference/2009/welcome.htm and click on the fifth link in the blue bar menu on the right side of the page. "A Multi-Site Study to Characterize Pressure Ulcers in Long-Term Care Under Best Practices: Final Technical Report for the U.S. Justice Department"
Background: Pressure ulcers may occur under circumstances ranging from excellent care to severe neglect. At present we are guided by a combination of common sense, anecdotal evidence, and clinical experience to determine when a pressure ulcer is a forensic marker of neglect. Scientific evidence is needed to better understand when they are truly markers of neglect. In order to understand this, we must first understand the characteristics of an ulcer that occurs under circumstances of good care. Study Hypotheses: 1) Long-term care residents may develop advanced stage pressure ulcers despite good care. 2) These pressure ulcers will be noticed prior to becoming a stage 3 or 4. 3) These ulcers share some common characteristics that have forensic value. What are the characteristics of advanced pressure ulcers in the setting of good care? Do advanced stage pressure ulcers develop in the setting of best care practices? Can an advanced ulcer present without a prior recognition of a lower grade ulcer? Setting: Best-practice, long-term care facilities throughout the United States. Methods: Best-practice long-term care facilities are identified through federal databases. The high quality of their care is confirmed through site review. After an eligible resident is identified and consent obtained, a research RN documents all characteristics of the advanced pressure ulcers using a standard instrument. Digital photos are taken of the ulcers. Pertinent information regarding the resident’s care will be abstracted by the research RN. The initial stage of the ulcer and the time the skin was last intact will then be recorded. A panel of elder abuse experts will review the medical information and rate the quality of care the resident has received on a 1- to 5-point Likert scale with 5 being the best care possible. Only those residents who are judged to have received a 4 or 5 will be included in the study. Analysis: Descriptive analysis will be performed to examine pressure ulcer characteristics that occur in a setting of good care including documenting and analyzing the number, severity, and location of the ulcers. We will also specifically determine if an advanced stage ulcer can develop without a prior documentation of a lower grade ulcer. This consortium project, funded by the California Department of Health Services brought together resources from UC Irvine's Program in Geriatrics and Institute for Brain Aging and Dementia as well as the Alzheimer’s Association of Orange County (AAOC). The goal was to better understand the factors that affect the quality of caregiving for people with dementia. The study participants were people with dementia still living at home and their caregivers. The researchers assessed characteristics of the caregiver (e.g., health), the patient (e.g., level of dementia), and their environment (e.g., use of outside resources) to see which of these were associated with mistreatment. The focus was on physical and psychological mistreatment as well as neglect. An multidisciplinary LEAD panel (Longitudinal, Experts, All Data) panel assessed presence of mistreatment based on prior definitions of physical and psychological elder abuse and neglect by a caregiver. The findings indicate high prevalence of mistreatment of people with dementia (47%) and identified some patterns and characteristics that can alert others to the possibility that mistreatment is occurring. Click here for a printable slide-based handout (PDF) highlighting the specific findings. The ultimate goal of this project, Systems Analysis & Implementation Improving the Quality of Elder Abuse Data in California, was to improve the quality of state-wide data on elder abuse in California. The project was funded by the Archstone Foundation. The best data available on mistreatment of older adults in California is reported by Adult Protective Services (APS) agencies, and yet there is evidence of inconsistency from county to county. The researchers talked to 54 of 58 APS county offices in California by phone, conducted a number of site visits and collected data in an online survey. The results of this study will help a statewide committee address improvement of the quality of APS data collection. Some of the findings are being prepared for publication. Access the "Taking the Guesswork Out of Findings" webinar recording sponsored by the NAPSA-NCPEA Research Committee with support from the National Adult Protective Services Resource Center. Presenters Lori Delagrammatikas, Mary Twomey, Krista Brown, Kris K. Brown, and Mary Counihan discuss how researchers and APS practitioners worked together to assess the variability in APS decision-making across California. Based on the research findings, a team of researchers and APS practitioners developed and implemented a protocol to improve the consistency of APS investigation findings in California. Read "Research to Practice Partnership -- Taking the Guesswork Out of Findings" a Research to Practice Brief prepared by National Adult Protective Services Resource Center. The projected rapid increase in the population of older Americans over the next 30 years raises the concern that the problem of elder mistreatment will grow at least as much and as fast. Although it is clear that the problem of elder mistreatment is already large – the best estimate is that one to two million older Americans are victims of mistreatment annually - most events are never reported. The personal costs are profound: not only do victims suffer from their injuries and losses, they are likely to die at an earlier age than elders who are not victims of mistreatment. There is very little understanding of the issues that surround elder mistreatment, for example risk or preventive factors, medical markers, consequences and clinical courses, healthcare and other costs, successful interventions and, methods for studying each of these issues. Current approaches to detecting abuse for research purposes are either invalid and unreliable or cumbersome, and difficult to apply on a broad scale, making population studies unfeasible. There is a desperate need for a standardized measurement approach that can be generalized across groups. This project was funded by the National Institute on Aging to develop and test a self-reported, survey-based measure that can be broadly applied to generate population estimates of abuse and move elder mistreatment research forward. The survey is designed to predict elder mistreatment in samples of Mexican American and Non-Hispanic white community-dwelling elders, including the cognitively-impaired. The results of this study are being prepared for publication. Conceptual and operational definitions of five categories of mistreatment (PDF): These were developed by the study’s Multidisciplinary Advisory Board and used by the LEAD (Longitudinal, Experts, All Data) panel that provided the criterion standard for the study. In order to determine whether people with dementia (ages 55 and older) can provide reliable evidence as witnesses to emotional events, this study conducted a cross-sectional analysis of 95 people with dementia and a control group of 50 older adults, eliciting memories of recent autobiographical events with both positive and negative emotional content. The study determined that a significant subset of older adults with dementia illnesses can reliably report on emotional events that have happened to them. Compared to people with dementia who have less reliable emotional memory, these individuals were able to report details of the event accurately and to recall the same event with the same accuracy after a short time delay. This subset of the dementia sample are likely to be in an earlier stage of the disease, to be more aware of their own cognitive impairment, to be more likely to report negative events in their lives, and to be able to recall an event without cues. These findings suggest that older adults with dementia who are crime victims should be evaluated for their ability to remember emotional events in which they have been involved. If the evaluation shows the capacity to remember autobiographical emotional events, the individual should be allowed to provide testimony about the criminal events. This research report focuses on developing a theoretical model for elder mistreatment, a relatively new family violence-related issue that lacks empirically based knowledge and a theoretical framework within which to understand its multiple manifestations. Effective intervention and prevention strategies depend on theory-driven hypotheses testing in order to understand how risk factors at various social-ecological levels interact in the etiology of elder mistreatment. To foster theoretical model development, this report takes an inventory of the empirically derived knowledge on elder mistreatment, reviews the major theoretical approaches to the etiology of elder mistreatment, and proposes a new model of elder mistreatment of older adults with cognitive impairment. Each component of the work was heavily informed by the methods and models from the adjacent areas of inquiry — child maltreatment and intimate partner violence. Information was obtained through an extensive literature review of the criminal justice, psychology, sociology, gerontology, forensics and public health literature as well as from interviews with experts from the elder mistreatment, child maltreatment, and intimate partner violence fields. For this study, funded by the National Institute of Justice, researchers are gathering information from county coroner’s offices throughout California. The purpose of the study is to collect and analyze data associated with elder deaths as well as to gain understanding of processes county offices in California use to support the decision to assume jurisdiction or not for a reported death of an older adult. The report for the NIJ, entitled, Coroners' Investigations of Suspicious Elder Deaths, is available as a PDF. Published research in the field of mistreatment of elders and adults with disabilities has developed to the point where there are often several articles on key questions. These Fact Sheets created by the Center of Excellence on Elder Abuse and Neglect are designed to synthesize research findings related to a key question related to elder abuse. Designed for practitioners in the field, researchers and policy makers, the Fact Sheets highlight the research findings succinctly and give full references to the original research studies to allow the reader to find the full article. Each NCEA research translation highlights the key points of a single aging- and abuse-related research article in a convenient one-page summary for use by practitioners working with older adults. To access journal articles and abstracts related to our research studies, visit the Publications section.